Indie darling Torchlight isn't just a cult hit anymore: It's an actual hit, reaching "Gold" status with half a million units in the hands of gamers. "If we sell a million, we will have more than broken even - we'll all be very, very happy." According to a post on the Runic Games Twitter account, the game is halfway there: As of Sunday, Torchlight has sold half a million copies, giving it "Gold" status. I'm not sure exactly what metric they're using, but it's still a landmark for a small indie title all the same. 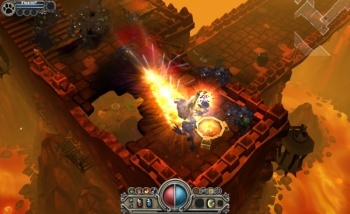 Part of the appeal is undoubtedly the price: Torchlight is normally $20, but sees frequent sales on Steam as with the sale celebrating the service's Mac launch. "We could have sold copies for more, but I think that $20 was the right price," said Lead Designer Travis Baldree. "It lets us recoup our expenses, and it's sort of a 'magical' price where people can just make the buy without having to fret so much. If their friends tell them, 'Hey, this is a great game,' they can make the decision then and there. It's the cost of a DVD; it's the cost of a large pizza." By the looks of it, plenty of people are finding Torchlight worth the price of a large pizza. Congratulations, guys!